As the discussion about CMS student assignment expands, so does the interest in comparing Mecklenburg County schools to Wake County’s relatively less segregated schools. It is however, inaccurate, to use a broad-stroke Mecklenburg-Wake comparison to argue that concentrating poverty does not matter. 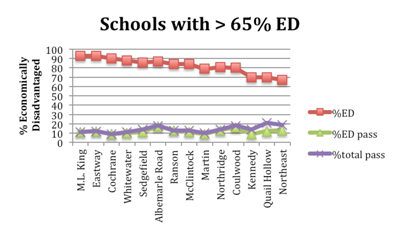 This is because the economic composition of schools varies significantly within each district. 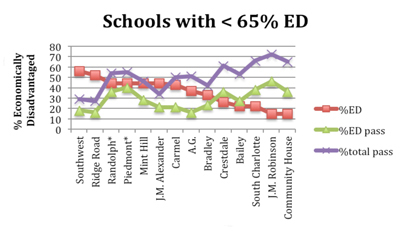 Many of Charlotte’s low-income students attend mixed-income or low-poverty schools. As the following numbers indicate, within CMS, low-income students at lower-poverty middle schools generally perform significantly better than those at high-poverty middle schools.